A Guwahati-bound special train carrying about 1,600 affected passengers left flood-ravaged Kerala’s Trivandrum and arrived at the Guwahati Railway Station on Thursday. 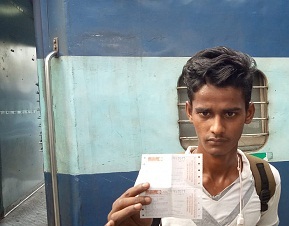 Mazibul Ali, a resident of Barpeta, who was one among the 1,600 passengers, alleged that though the Assam Government had made tall claims that all help would be rendered to the people from Assam coming on the train back from Kerala, they (read Mazibul and his friends) did not receive any help. “We even bought the train tickets by spending our own money and the Travelling Ticket Examiner (TTE) charged Rs 1,200 to those passengers who were travelling without tickets,” fumed Mazibul. Mazibul said that he along with his friends spent two nights at Ernakulam Railway Station without any food before leaving for Guwahati on August 19 last. “We have not received any free food or any other relief materials during the whole journey period,” he remarked. Ilias Ali, a resident of Chamata in Nalbari district, said that “people stayed in the Railway Station without food for days together”. On the other hand, the Centre of Indian Trade Unions (CITU) distributed biscuits, bananas and drinking water bottles among the people who arrived from Kerala at the Guwahati Railway Station at around 4 pm on Thursday. However, the Assam State Disaster Management Authority (ASDMA) has opened helpline numbers 0361-2237219, 0361-2237460 and 9401044617 to assist people of Assam stranded in Kerala.